Right up in the northernmost frontiers of the Kumaon Himalayas, the Johar Valley remains till today one of the less frequented but well-coveted destinations for the true lovers of the Himalayas. Nanda Devi needs no introduction. Ever since the closure of the sanctuary, knowledge about this cross-section of the Himalayas continues to be the preserve of books and periodicals only. But lately, with the relaxation of the inner line permit, it has now become possible to walk up to the Nanda Devi base camp through the Johar Valley from Munsiyari. Overnight journey by bus. arrival in the morning at Pithoragrh, also known as a part of Sor valley. Pithoragarh is curious amalgamation of the town and the village, the settlement and the agricultural fields. Famous for leather, woolen, wooden and cane goods, the town also has a host of temples. Day 02: Pithoragarh - Munsyari distance is 154 km. Overnight stay at Munsyari which is the road head of the trek. From Munsyari one gets an excellent view of the Panchchuli peaks. After breakfast vehicle will drop participants at Darkot (4 km.) from where trekkers will commence walking along the banks of Gori Ganga at an average height of 4500 ft. Our destination is past Lilam village to Raurgari where we camp for the night. Day 05: Rilkot - Martoli Village (3324 m.) - Lawan (3600 m.) 10 km. trek. You are in high mountain country now and the tree line disappears giving access to vast stretches of Alpine pastures. One gets the view of the Martoli peak soon after Rilkot and we reach Martoli and explore the town before lunch. The trek to Lawan is along the river and through meadows with the Nanda Devi looming up large ahead. Day 06: Lawan - Shiama Kharak (4200 m.) 10 km. Shiama Kharak with its rolling meadows is our base camp. From here only we can get fantastic views of the biggest Indian Himalayan Peaks. Day 07: Bhital Guar (4450 m.)5 km. 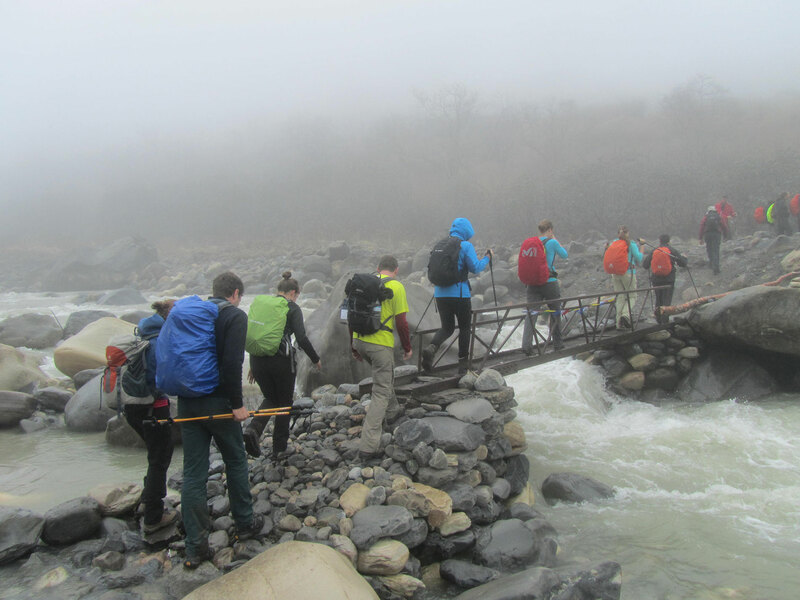 Day trek to the base for views of the glacier and the peaks. From here we can visit the glaciers on the Traill’s pass area and the base camp for Nanda Kot. It is a day to rest and simply enjoy yourself in this magnificent location. Options include the hike up to the snow ridges of Nanda Devi East. There have been several sightings of bluesheep in the region.